Tennessee Volunteers play college football at Neyland Stadium in Knoxville TN. Legends of the UT Vols include Peyton Manning, General Robert Neyland, Hank Lauricella, John Ward, Reggie White, Doug Atkins, Beattie Feathers, Bob Suffridge, George Cafego, Johnny Majors and Jason Witten. 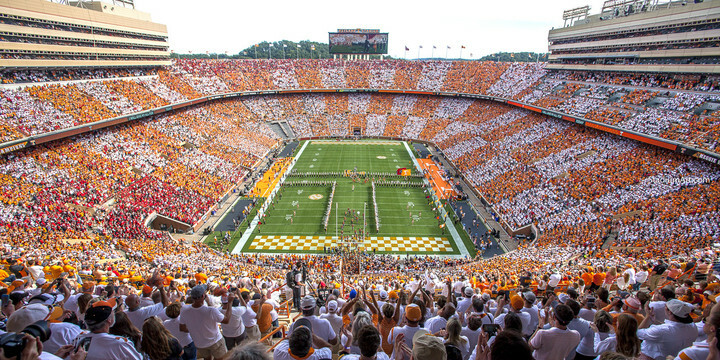 Iconic images include Peyton Manning Leading the Band, Vol Walk with Phil Fulmer, John Ward announcing overlooking Neyland Stadium, General Robert Neyland on the bench with Hank Lauricella, Smokey Mascot the Mascot howling on the sideline, Running through the T, Building Neyland Stadium, Checkerboard Orange White stands of Neyland Stadium, and more. The Vols play NCAA college football in the SEC Southeastern Conference. The fine art photos are available in various sizes including 11x14 photo, 13x19 print, 8x10 image and 40x30 canvas frame.